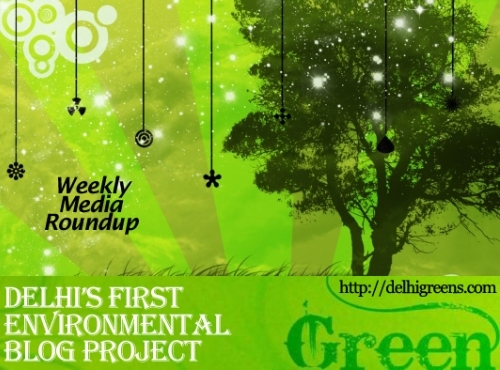 Weekly green news update from across different media networks for week 31 (between August 1 to 7) 2016. Mehrauli Archaeological Park that houses over 250 monuments has fallen prey to unchecked dumping of garbage and debris. South Delhi’s green cover is under threat due to various reasons, be it mindless chopping of trees by authorities or the carelessness of locals. Monsoon is the best time of the year to plant trees. Each year the civic bodies in south Delhi launch a large-scale plantation drive at this time. The concept of rubbish may not have changed, but what happens to your waste once you have disposed of it has changed radically in recent years. A recent study by the Delhi University has revealed the presence of harmful chemicals and heavy metals in the city’s groundwater resources. If this groundwater is consumed, according to the study, it can lead to serious health problems in the nervous system, kidneys and the digestive tract. The Union Home Ministry has advised the New Delhi Municipal Council to get the decibel level of its garbage vehicles tested to look for any noise pollution. Identify wetlands within a week: NGT tells govt. The Delhi government has been directed to expeditiously identify wetlands in Dwarka sub-city after an environment activist sought the National Green Tribunal’s intervention in the matter. Garbage disposal won’t be a hassle for residents if they make a little effort and adopt simple methods. The National Green Tribunal has asked Delhi’s transport department to register 10 new diesel vehicles for North Delhi Municipal Corporation only after the civic body produces the certification about dismantling of its nine old vehicles. A recent study by Toxics Link, an environmental NGO, found triclosan, an endocrine disrupting chemical, in 72.8% of samples of two items of everyday use it tested in Delhi to determine the levels of the antifungal antibacterial agent present in them. National Green Tribunal on Friday expressed disappointment over lack of coordination among state and central agencies in implementing its order on Mailey Se Nirmal Yamuna Revitalisation Project 2017. The National Green Tribunal has directed the Uttar Pradesh and Uttarakhand governments to submit crisis management plan for prevention and control of forest fires to the Ministry of Environment and Forests within two weeks. The National Green Tribunal has directed the Centre and Delhi government to demolish illegal religious structures in the Central Ridge area near the Birla temple here within two weeks. With the issue of toxic waste being released from industries becoming a major environmental issue, the National Green Tribunal has directed various State governments including the national Capital to state how many industries were authorised to deal with hazardous waste. NITI Aayog is likely to unveil the new National Energy Policy in the next three months with a focus on air quality issue, renewable energy, natural gas, universal electrification and clean cooking fuel. The much-awaited monsoon season has finally arrived, marking an end to a year of winter smog and the overbearing summer heat. The Wildlife Institute of India here will now house the country’s first repository on tigers, under its new Tiger Cell.